2998.8 GBP Contact for Availability. Please phone 0333 2000 750. Impact absorption system provides the superior feel for all users, reversible deck for longer life time. 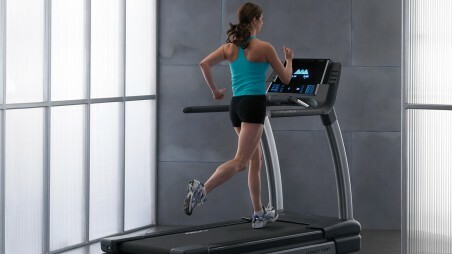 The Impulse RT700 is one of the most popular commercial treadmills we supply. It can be found in facilities across all sectors of the fitness industry, from independent gyms, police and military sites, to schools, colleges and even local authority facilities. This high-quality model is built to last even in high usage situations. It's simple but effective console also offers all the readouts, feedback and workout options users cite as being most important. This is what makes the RT700 the ideal choice for your facility. This treadmill boasts a rust-resistant undercoat and a reversible deck allowing for a greater lifespan of the components. The maximum user weight this machine can take is 200kg and it is capable of an incline of up to 15 degrees. The wide running surface of 59cm (22”), and the quiet operation, gives the user confidence on the machine, and the low profile (step height of only 21.6cm (8.5”)) makes it accessible to a more extensive demographic. This model also offers a 5 degree inward tilted design to offer a more comfortable position when users step on. A PVC anti-slip side stripe also provides further safety and security. Finance options are available on all orders over £280. You can select your finance option by adding your item(s) to your shopping basket and then choose the DEKO finance option in the payment section at checkout. Note: Finance is only available to UK residents over the age of 18. Subject to terms and conditions. Signature on delivery will be required. Goods will only be delivered to your billing address, and not to an alternative delivery address. Find out more about financing your purchase.